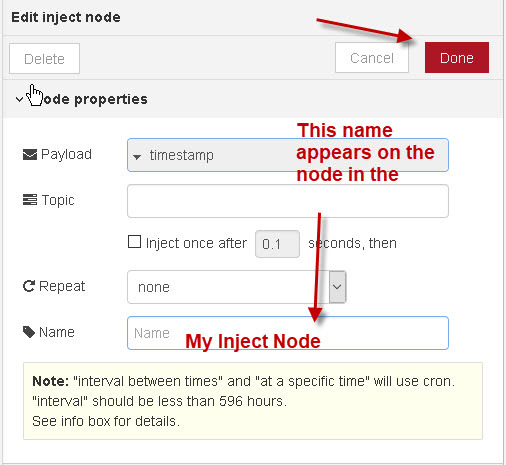 To administer node-red you will need to go the admin url. 127.0.0.1:1880/ if you are running the browser on the same machines as node-red. 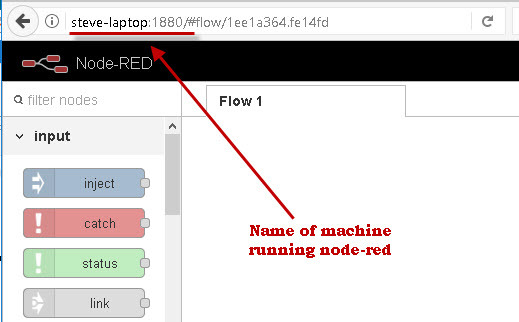 I currently run node-red on a Raspberry Pi and use a second machine (windows 10) to create flows. When you open the node-red admin screen for the first time you should start with an empty work space as shown in the earlier screen shot above. The default view is a three column layout with nodes on the left ,the flows work space in the middle and a third column on the right. The third column or output pane has two or three tabs – info, debug and dashboard ( if installed). Note: In the latest version 0.19 there are now 5 tabs.The two new ones are the configuration tab and the context tab. Nodes are the basic building block of node-red. A node is effectively a software block that processes messages. A node can have inputs and outputs which enable messages to be passed between nodes. An input can accept connections from multiple nodes and an out put can output to multiple nodes. The nodes in the left pane are arranged in categories. Other groups can be created when new nodes are installed. Here is a very good overview video. Each node has a well defined function and contains its own data. You can install additional nodes using either the npm package manager or using the Admin Interface. There are two nodes that you will find yourself using quite often. They are the debug node and the inject node. Node-Red is an event based system and something must happen to create an event. 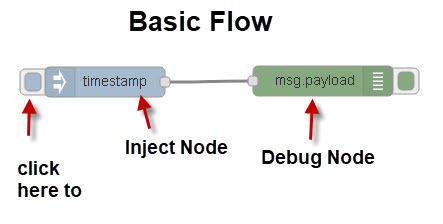 The inject nodes will fire a message ( msg) into the next node and is used to trigger a flow. The debug node is used for displaying output for debugging purposes. By default it will display the message payload but can be configured to display the entire message object. If you double click on the node on the canvas then you can edit the node properties. All Nodes have a name property. This is the name that is displayed on the canvas. You can wire the inject node into the debug node to create a basic flow as shown below. The above flow will inject a unix timestamp into the debug node which can be viewed in the debug tab in the far right pane. 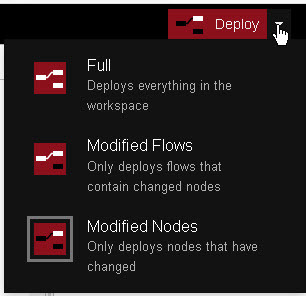 When you start node red then all currently enabled flows are automatically started. 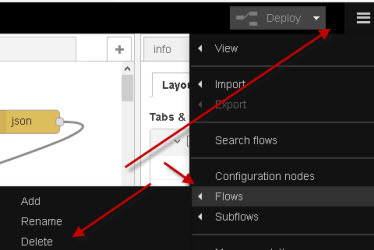 If you edit or create a new flow you will need to deploy it using the deploy button. The Deploy button on the top right change from grey to maroon when changes have been made to a flow to indicate that in it needs to be deployed. The workspace consists of all of your flows. Along the top of the workspace pane are tabs that are used to open previously created flows. You can create new Flows by clicking on the Plus button on the top right. When you create a new empty Flow it is given a default name and is enabled by default. Generally a new flow is created when the flow needs to do a distinct task. 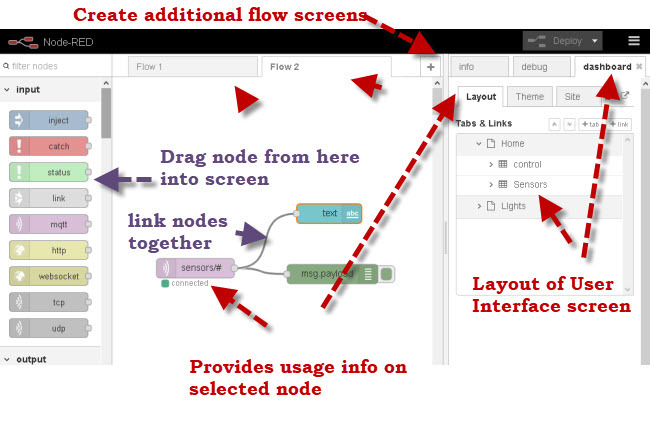 To add nodes to a flow drag them from the node palette on the left into the active flow in the middle pane. You can link the nodes together by dragging a wire between them. A collection of nodes is called a flow. Note: All flows in the workspace share the same node.js event loop. A flow called Flow1 is pretty meaningless and so you should rename it to something more meaningful. You can access the flow properties from the settings tab. You need to select the flow in the workspace and then. 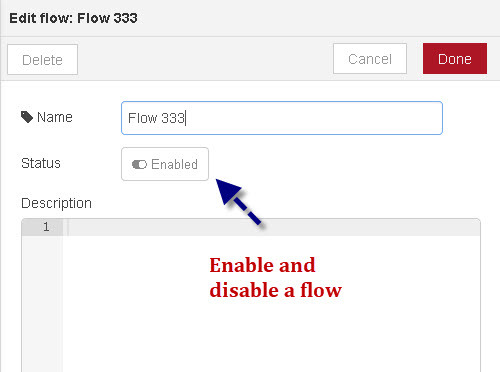 to open the flow go to the menu (top right) and select flows> rename flow, delete, add. If you select rename then a window opens that displays the flow properties . You can rename the flow, and there is also a toggle to enable/disable it and also a button to delete it. There is also a delete button to delete the flow on the top left. You need then to redeploy for the setting to take effect. You should notice the icon in the flow tab that indicates that the flow is disabled. Hi - I'm Steve and this is my website on IOT technologies and services. If you feel that you have learned from this site and would like to support my work and show your appreciation then please consider making a small contribution by clicking here.